Learn about Titanic's interior and fittings: Photp’s and information about dining rooms, decks, rooms and accommodation for passengers of Titanic. Lavish, Opulence and Edwardian styling. Titanic: Inside the grandest ship of all time. If the Titanic's sheer size did not overwhelm and impress its passengers then a tour of its lavish interior surely would. The interior of the Titanic was often likened to a floating palace containing some of the finest examples of craftsmanship and interior design ever seen in an ocean liner to this day. Titanic was fitted after the hulls construction in Dry-dock at the Harland and Wolff shipyards in Belfast. In February 1912 the Titanic was dry-docked for the final time to have her propellers fitted and given a final coat of paint. During this time the final additions were made to the Titanic before her sea trials and maiden voyage both occurred in April. Titanic's grand staircase displayed a level of opulence unseen in any form of travel at the time. The Grand Staircase: This was the Titanic's crowning glory. Constructed from polished oak, wrought iron and an assortment of boutique glass the grand staircase was situated below a beautiful dome that gave an excellent illusion of natural light at any hour of the day. The centerpiece of the grand staircase was a large carved panel containing a clock. Passengers would descend the staircase to enter first class dining room or take the very modern elevators. James Cameron's director of Titanic went to painstaking lengths to ensure the accuracy of the grand staircase working from original plans and materials which can be seen in the picture from the film here. 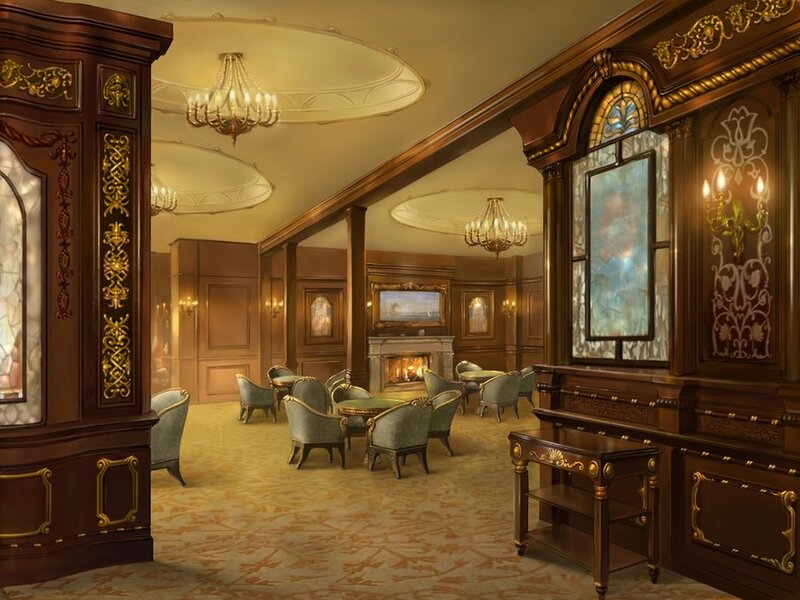 The First class Lounge: This Edwardian inspired lounge is were first class passengers would gather to play cards and discuss the burning issues of the day. Passenger accommodation and public areas were located on the Promenade, Bridge, Shelter, Saloon, Upper, Middle and Lower Decks. The other three were reserved for the crew, cargo and machinery. The Boat and Promenade Decks were above the superstructure of the ship. Their lengths did not run the entire length of the ship. The Boat deck was the uppermost deck on the Titanic. It was so named because lifeboats were stored there. The Boat deck offered the only real open space on the ship. First- and second-class passengers could stroll, rest on benches, play quoits (a game similar to horseshoes), or simply lose themselves in quiet contemplation on the Boat deck. Third-class passengers did their promenading on the Bridge (B) deck since they weren’t allows on the Boat deck. The Bridge deck was a platformlike poop deck located at the aft of the ship. However, they were obliged to share this crowded space with cargo and equipment. During Titanic's design, entirely new features were added which had never been seen before. A swimming pool, Turkish Baths, Squash courts and a gym were provided. Titanic's gym was a world first. The First Class gym: Passenger Richard Norris peddled a stationary bicycle as the Titanic sank to keep warm along with some other passengers. He survived on board a collapsible lifeboat and went on to have a successful tennis career. First-class passengers had the use of the Titanic’s state-of-the-art gymnasium, which was located on the Boat deck. It included the usual dumbbells, rowing machines, and so on, as well as a mechanical horse and mechanical camel. The cost to use the gymnasium was one shilling (about 25 cents), to be paid to Thomas McCawley, the on-site gymnasium steward, who dressed in white flannels. The Titanic boasted exclusive, first-class and men-only Turkish baths. Male first-class passengers who paid the $1 fee could visit the rooms with hot, temperate, and cool temperatures; a steam room; a private toilet; and even a shampooing room. The Turkish baths also offered a freshwater drinking fountain (made of marble) and featured ornate tiles in the Arabic style and comfortable lounge chairs where passengers could rest. The first class public rooms included a dining saloon, reception room, restaurant, lounge, reading and writing room, smoking room and the veranda cafes and palm courts. If a parlor suite didn’t suffice, a wealthy family could purchase several first-class cabins adjacent to one another and open the interconnecting doors between the cabins to have a suite of their own. Cafe Parisien: This was a very popular eating area on the Titanic as it resembled the boutique cafes of modern Paris. 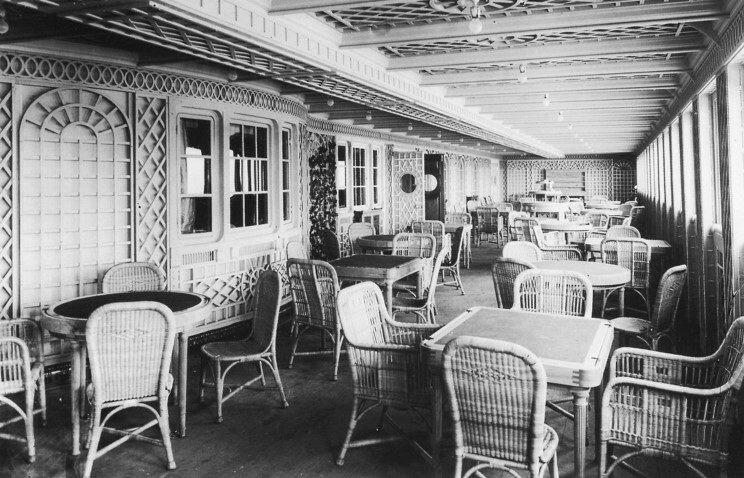 Also on the Promenade (A) deck, first-class passengers could avail themselves of the Verandah Café and Palm Courts. The large windows, wicker furniture, trelliswork, potted plants, and checkered floors in these rooms suggested being in the English countryside. First-class children favored the Verandah Café and often went there to play together. 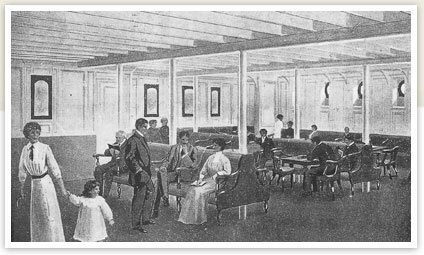 First-class passengers also had the Lounge, a luxurious room on the Promenade (A) deck meant for socializing. This rich, oak-paneled room had alcoves where passengers could talk to one another with a degree of privacy. Lounge decorations were modeled after the Palace of Versailles. Coffee, tea, and liquor were served in the Lounge. Titanic's reading & writing room was purpose built for first class women. The Reading and Writing Room: This room was really designed for use by traveling first class women. It was painted in white and furnished very elegantly. There was a huge bow window that enabled the occupiers to lookout on to the Promenade Deck. There was a large fire which burned intensely adding warmth to the room. First Class Lounge: The Lounge was situated on the Promenade Deck and again elaborately fitted out. This room was dedicated to reading, conversation, playing cards and other social interactions of the day. It was decorated in the French Louis XV style. The craftsmanship was exquisite. The walls were covered with "boiseries" (elaborate wooden carving) which gave the room a distinct symmetrical appearance. 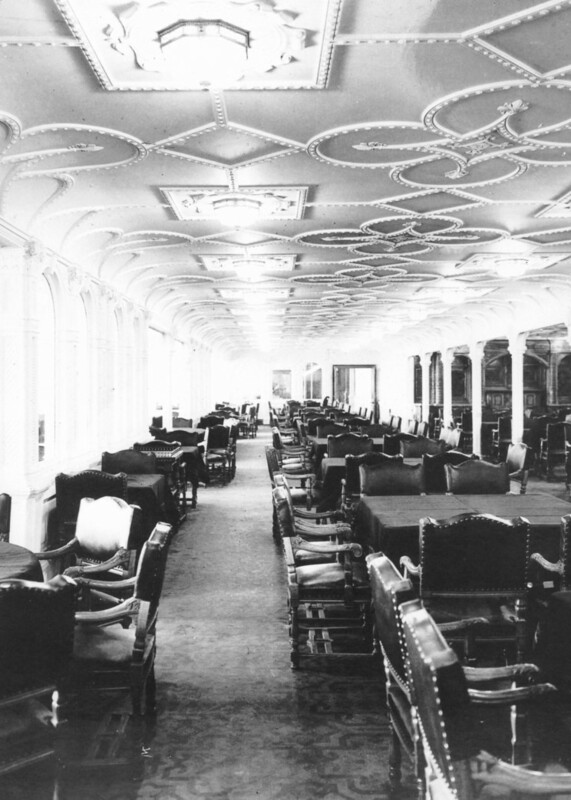 First Class Smoke Room: Towards the back of the Promenade Deck was situated this very fine room. The walls of the first class Smoking Room were panelled in mahogany carved in the Georgian style and were inlaid with mother of pearl. Above the centrepiece fireplace was a painting by Norman Wilkinson called the "Approach to the New World." Those who required an after dinner drink could find exactly what they wanted in the well-stocked bar. Others enjoyed walking around the room looking at the painted glass windows depicting many different ports from around the world, and other White Star Line ships. On the portside of the room was a small Verandah area, which led to the Palm Court areas (30ft by 25ft) overlooking the aft Promenade Deck. Walled trellises with climbing plants gave the impression that the room was part of a conservatory. Passengers could sit on wicker chairs to finish their drinks. First Class Reception Area: Behind the Grand Staircase was a spacious Reception Room 54 foot long. It was decorated in the Jacobean style and had a white ceiling and a dark rusty colour carpet. Before dinner, saloon passengers could gather to discuss the day's activities aboard the ship. Some would sit on one of the many floral patterned Grandfather Chairs to be found there. The Reception Room led directly to the Dining Room. First Class Dining Room: The first class passengers would certainly dine in style. Their dining room was 114 foot long and spanned the full width of the ship. Seating 532 passengers at once, it was the largest dining room ever seen on a ship. The room was decorated in attractive Jacobean style, and was painted in peanut white. The decoration had been the result of painstaking research. The designs were based on Hatton Hall and some very fine houses in Hatfield, England. The furniture (chairs and tables) were oak and designed to add luxury and comfort at all times. In those days dinner was considered a very important part of a voyage. The first class dining room offered a' la carte dining. This restaurant served the finest meals all of which were not included in the fares of its guests. It added an extra touch of class. The room was decorated in Louis XIV style and had floor to ceiling panelling in French light brown walnut. Specially mounted ornaments and mouldings gave a regal effect. Candle-style lamps hung in the centre of the panels. Plain silk curtains covered the large bay windows that gave a great feeling of spaciousness. Passengers could sit around the tables in groups of two to eight people. An orchestra played to them from a raised platform. Dining would have been quite an experience. First Class Accommodation Titanic provided 39 private suites: 30 on the Bridge Deck and 9 on the Shelter Deck. The suites included bedrooms with private toilet facilities. All had up to five different rooms: 2 bedrooms, 2 wardrobe rooms and a bathroom. First class accommodation also held 350 cheaper standard cabins with single beds. The expensive and exclusive staterooms boasted excellent fittings. Each was decorated in different periodic styles including Louis XVI, Louis XV, Georgian and Queen Anne. 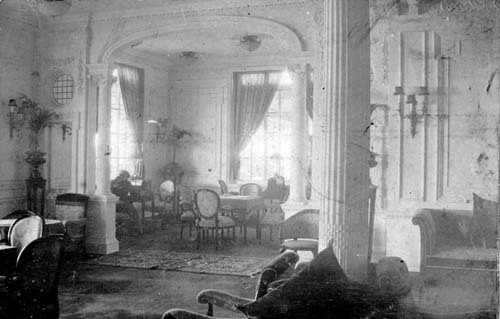 After dinner, the gentlemen of the second class could retreat from the Dining Room to their Smoking Room. This room was decorated in Louis XVI style and it had oak paneling with daido rails. Linoleum tiles were specially designed for the room and were unique to the ship. Library: After dinner, traveling second class women would part company from their partners and often sought in the Library. This was the equivalent of the First Class Reading and Writing Room. The room was excellently appointed filled with mahogany furniture. A large book case was situated at the forward end opposite the bulkhead. Large windows had silk curtains hanging. The rich fabric of the Wilton carpet gave a snug feel to the room. Second Class Dining Room: The Dining Room was 71 foot long and it could seat 2394 people at one sitting. The room had oak panels with pivoted sidelights which provided a great elegance dining room. There was a piano in the room to entertain diners. All the furniture was mahogany with crimson upholstery. 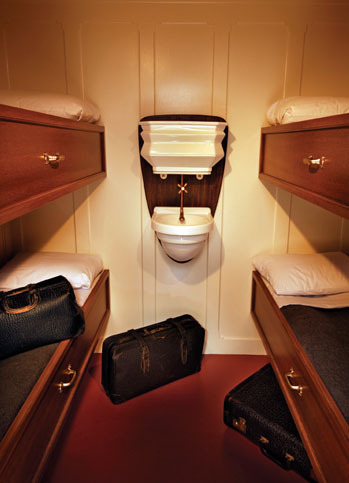 Second Class Accommodation: Second class accommodation was provided in either two or four berth rooms. A maximum of 550 passengers could be accommodated. The rooms were fitted in enamel white with mahogany furniture. In second class, passengers slept in berths built into the walls of the cabins. At two to four berths per cabin, privacy was hard to come by, although a passenger could close the curtain around his or her berth. Each second-class cabin had a washbasin and a chamber pot to be used in case of seasickness. Second-class passengers used communal bathrooms. The Staterooms of the second class were very similar to the standard cabins of the First Class. When comparing the size of room, staterooms and galleys etc. it must be remembered that the Titanic and Olympic set entirely new standards of transatlantic travel. The second class or middle class would have been treated in exactly the same way as the first class passengers would have been on other contemporary shipping lines. Second class rooms were tailor made to meet the needs of America's burgeoning middle class. 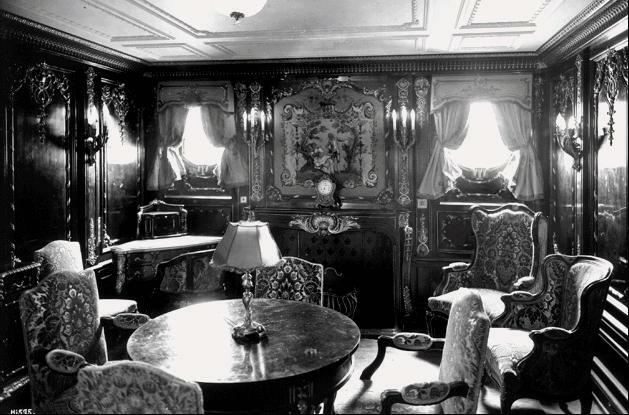 Titanic's third class smoking and general room. Third Class Smoke and General Room: The General Room was the heart of the Steerage, third class community. It was the main meeting room. It was panelled in pine and finished in enamel white with teak furniture. The Smoke Room was panelled and furnished in oak with teak furniture and was very comfortable. It was clear from outset that the White Star Line had given much consideration for the third class passengers, many of whom would be crossing the Atlantic to start new lives away from their home country left behind. The White Star Line wanted them to enjoy the voyage as a good start to their "new life." Although the cheapest. 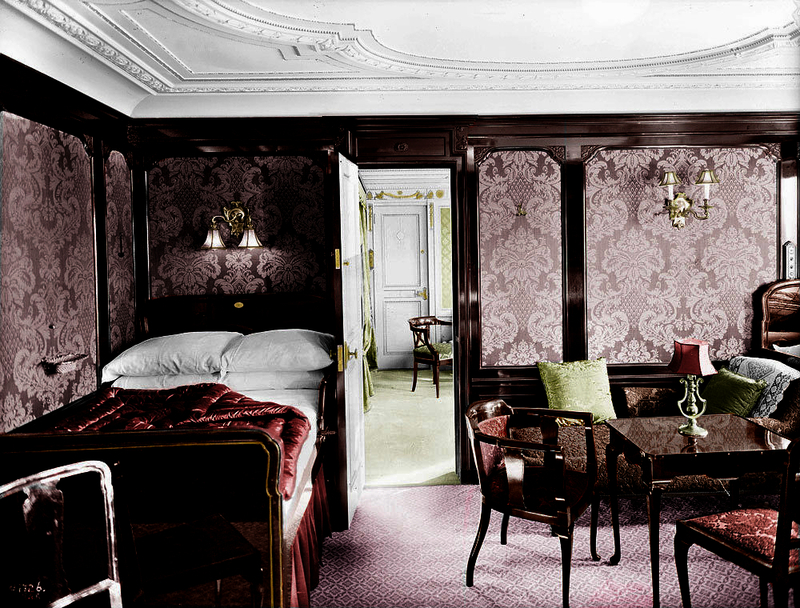 Titanic's third class accommodation was exceptional for 1912. 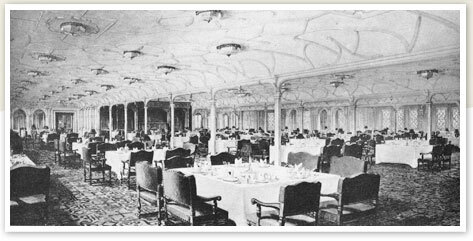 Third Class Dining Room: The Dining Room, situated on the Middle Deck, was 100 foot long and extended the full width of the ship. It could seat approximately seat 470 passengers in each of the three sittings. The pantries and galley were situated behind the Dining Room. There were over 1000 third class passengers on the Titanic. Their accommodation was much more modest than the other two classes. The rooms comprised mainly of two to six berth rooms. There were only 84 two-berth cabins on board. The size of the rooms compared to first and second class reflected the class attitudes of the age. The first class Turkish bath was larger than the third class galley. A thousand passengers would rely on the galley but only a handful would have used the Turkish bath. Although most passengers had to share bathrooms (only the two promenade suites in first class had private bathrooms), third class had it rough with only two bathtubs for more than 700 passengers. Third-class passengers slept on bunk beds in crowded quarters at six to a narrow cabin. Like second-class passengers, they shared bathrooms, but the number of people sharing a bathroom was much higher in third class: Only two bathtubs were available for all 710 third-class passengers, one for the men and one for the women. In those days, many of the poor believed that frequent bathing could cause respiratory disease; therefore, most third-class passengers likely didn’t lament the lack of bathtubs. privacy to the passengers, but they would still have shared their experience with strangers. 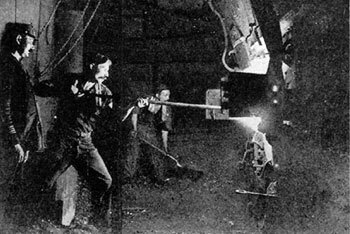 The engine room staff were housed on the starboard side at the forward end of the ship on the Lower, Middle, Upper and Saloon Decks. Two spiral staircases connected their rooms to the boiler and engine rooms.